Orlando, Florida, January 22, 2019 – (Perspective Magazine) Mexico’s luxury hospitality group El Cid Vacations Club and its three award-winning properties in Mazatlán are excited to welcome guests who want to experience one of Mexico’s most cherished traditions; Carnival, which runs from February 28 to March 5th. 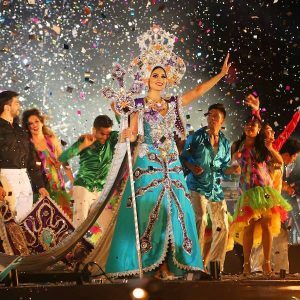 As the largest Carnival event in Mexico and the third largest in the world after Rio De Janeiro and New Orleans, Mazatlan’s Carnival week is a spectacular celebration and a cultural phenomenon. Now in its 121st year, Carnival in Mazatlán unites tourists and locals alike in numerous festivities to mark the week before Lent. This multiple day, continuous party features parades, fireworks, live music, and the Coronations of the Floral Games Queen, the Carnival Queen, the Children’s Queen, and the King of Joy. Carnival activities take place in Mazatlán’s famous Golden Zone, Malecon Oceanfront, the Centro Historico, and other locations throughout the city. Tickets for all 2019 Carnival events can be purchased at the Angela Peralta ticket office located in the Centro Historico, a dedicated kiosk outside of the Angela Peralta theatre, and at a kiosk located within the Gran Plaza Mall. Leading up to Carnival, there will be several events including Velada de las Artes (The Evening of the Arts) which will take place on February 22, the Muestra Gastronomica food festival at the Plaza Machado on February 28, and the annual Carnival masquerade ball that celebrates the start of nightlife during Carnival week. El Cid Vacations Club has been welcoming Carnival-goers and ECVC members for close to five decades at all three of its properties. El Cid El Moro, El Cid Granada Hotel, and El Cid Marina Beach are all superior options when wanting to be close to the excitement of Carnival. No matter which ECVC resort a member stays at during Carnival season, they will experience first-hand the award-winning hospitality, superb accommodations, and staff who are dedicated to providing the best experiences possible for every guest. For generations, El Cid Resorts and El Cid Vacations Club have welcomed travelers from all over the world to truly experience the rich culture and heritage of Mexico, not only in Mazatlán, but in Riviera Maya Puerto-Morelos and Cozumel as well.